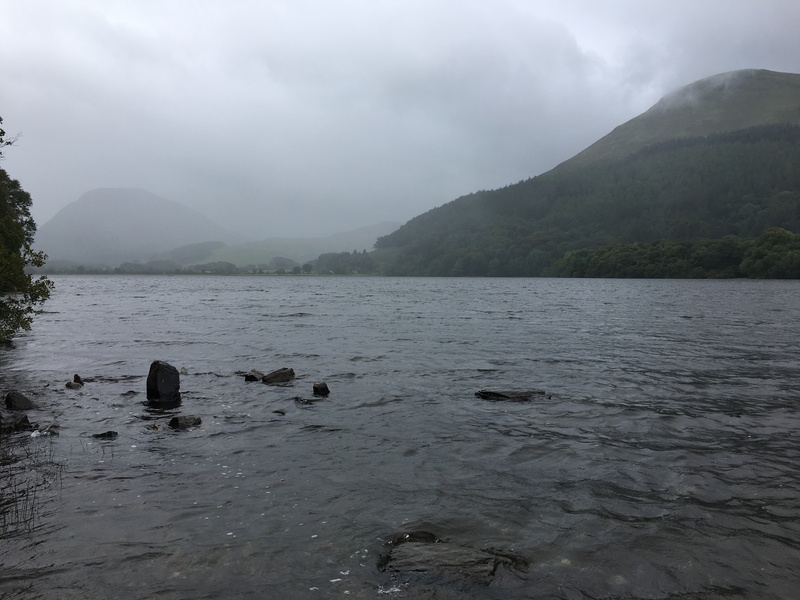 This is a short, low-level walk around Loweswater, which is both a lake and the name of a small village. It’s also the first walk in the Pathfinder Guide. 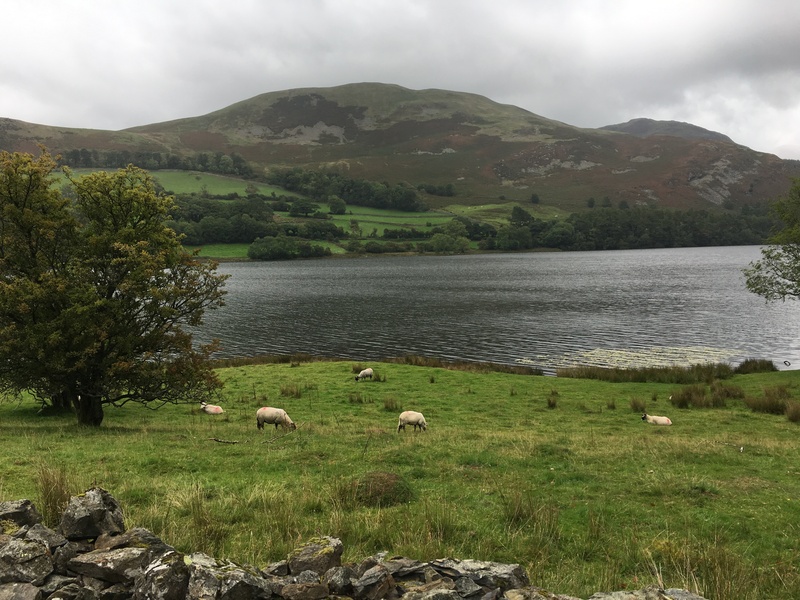 On the day that my family and I hiked around the lake, The Loweswater Show was coincidentally being held in fields nearby – making it quite a challenge to squeeze the car around the horse boxes leaving the show along the narrow country lanes. There is parking is lay-bys along the Northern side of the lake. 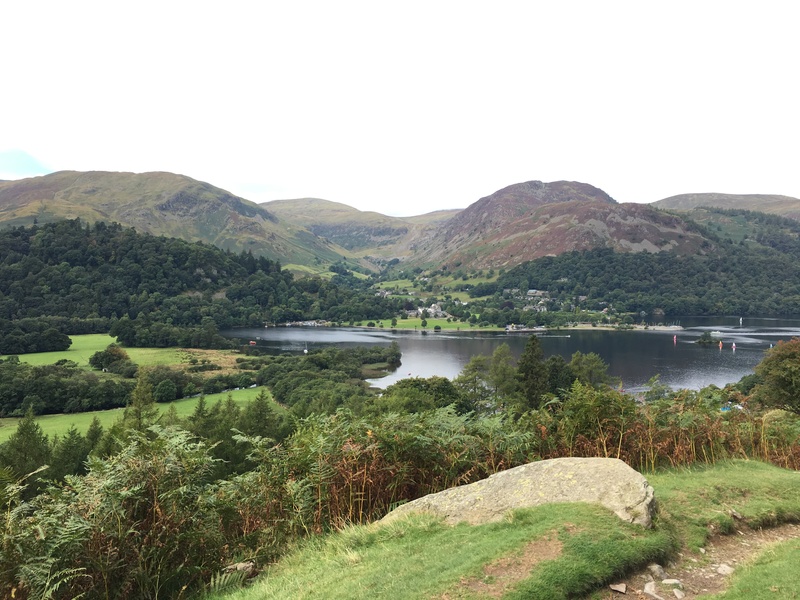 The route for the walk was quite easy to follow, being largely around the lake. There are some lovely sections on the North side of the lake where the path is directly adjacent to the water. 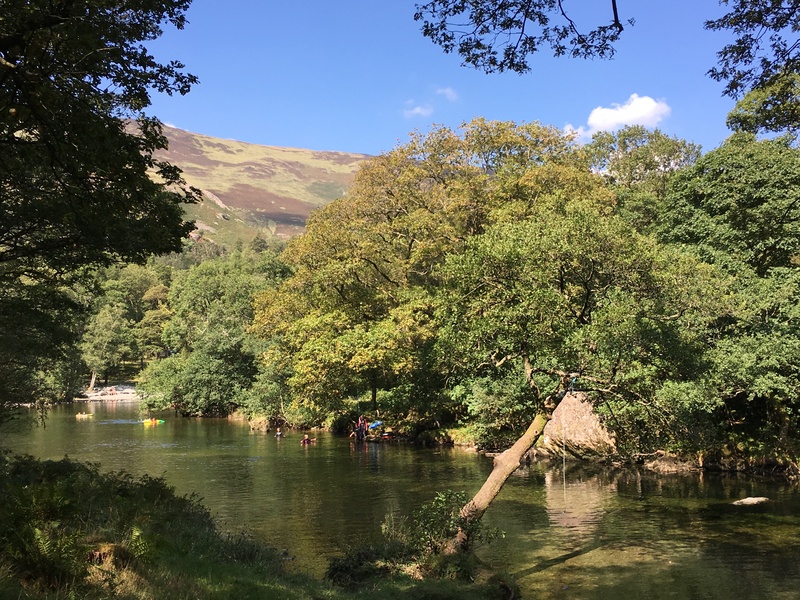 On the South side, much of the route is through woodland, although there is a stony beach with several ropes suspended from the trees – we caught a sheepish teenager enjoying a swing on those before he felt self-conscious. The walked was booked at 4 miles. 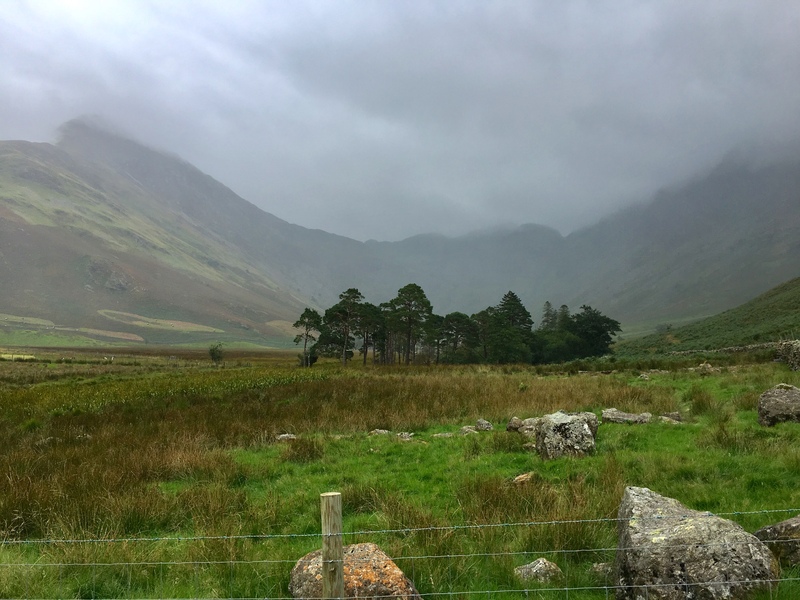 Having met up with family during our Lake District holiday, we went for a low-level walk around Buttermere. 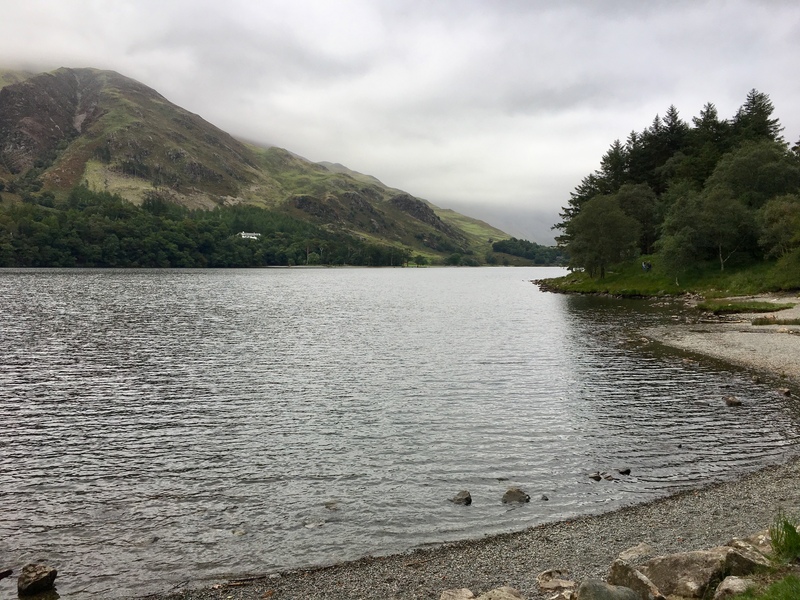 Although the drive from Keswick to Buttermere village over the Honister Pass can be hair-raising, it was worth it to enjoy an atmospheric walk around this popular lake. 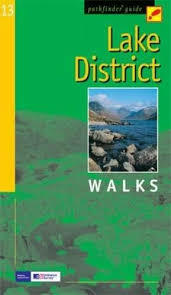 The route around Buttermere is pretty clear, and is half of a walk outlined in the Pathfinder Guide. 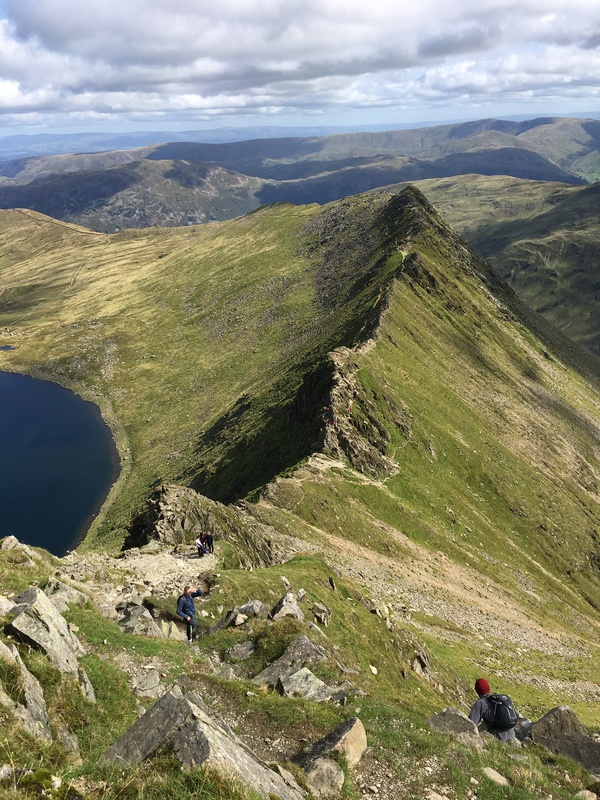 There is a more challenging walk starting from here, to include Red Pike, High Stile and Haystacks – terrific views from the tops. There are refreshments in several pubs in the village, we chose the Sykes Farm cafe, which was excellent. The walk was booked at 4.5 miles and my phone recorded just 9 floors climbed. This is a beautiful, low-level walk from the Pathfinder Guide. 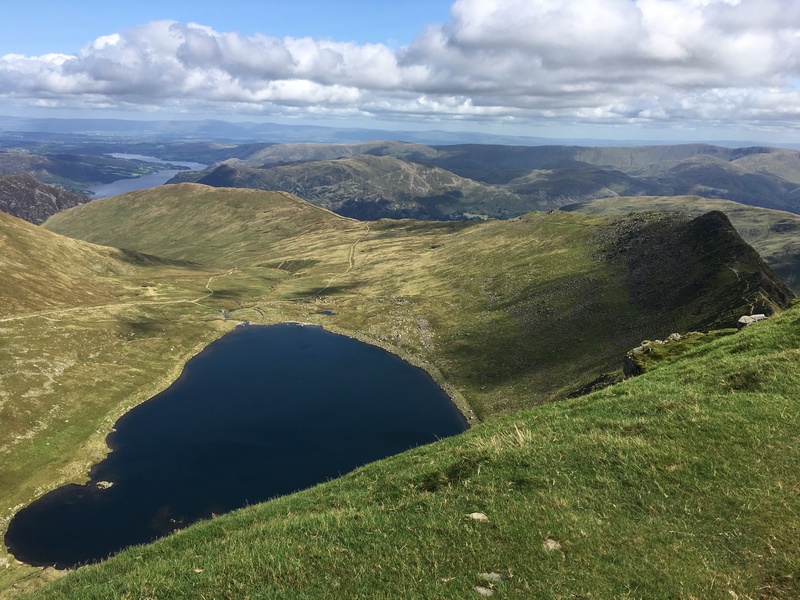 Although it doesn’t circle a lake or climb any of the famous fells, the route follows the River Derwent and provides spectacular views down the valley. 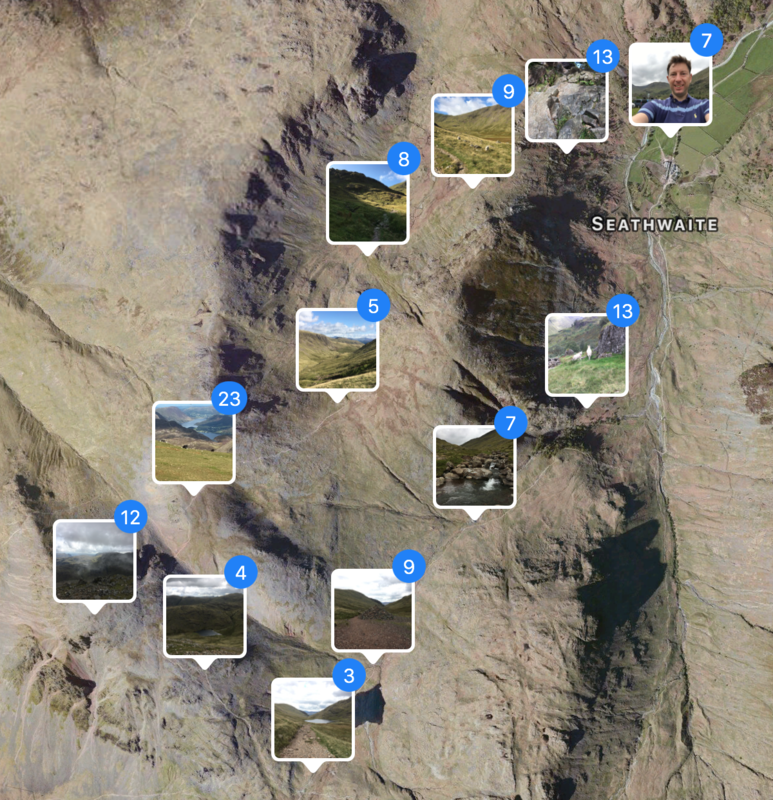 We walked the route in reverse, from Grange to Seatoller. Grange benefits from a lovely cafe as well as tea rooms – sadly, the cafe at Seatoller was shut when we arrived! 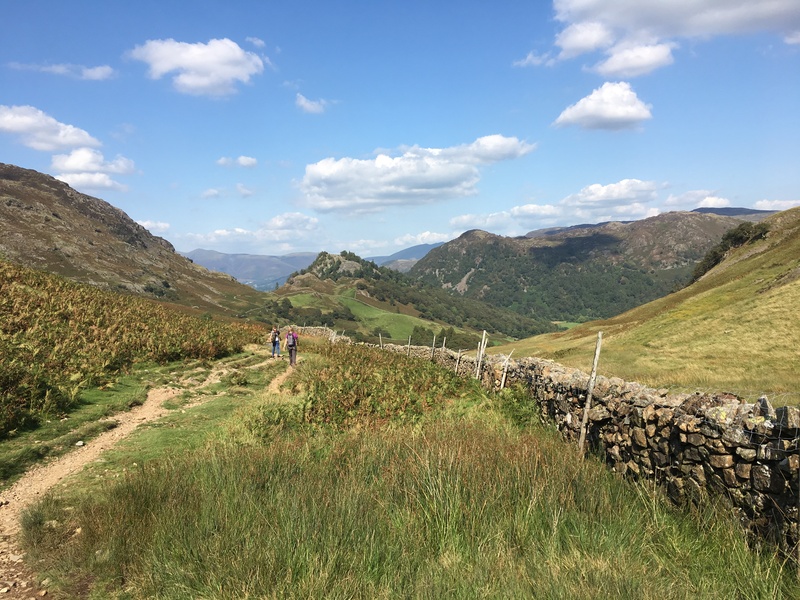 The route was quite easy to follow, except for the start of the footpath back from Seatoller – after following the road out of the village and up the hill, the directions are to take the footpath to climb steeply up the side of the valley. The footpath and gate were obscured by bracken, so only visible when almost on top of them! The route was booked at 7 miles and my phone recorded 18000 steps and 45 floors climbed that day. 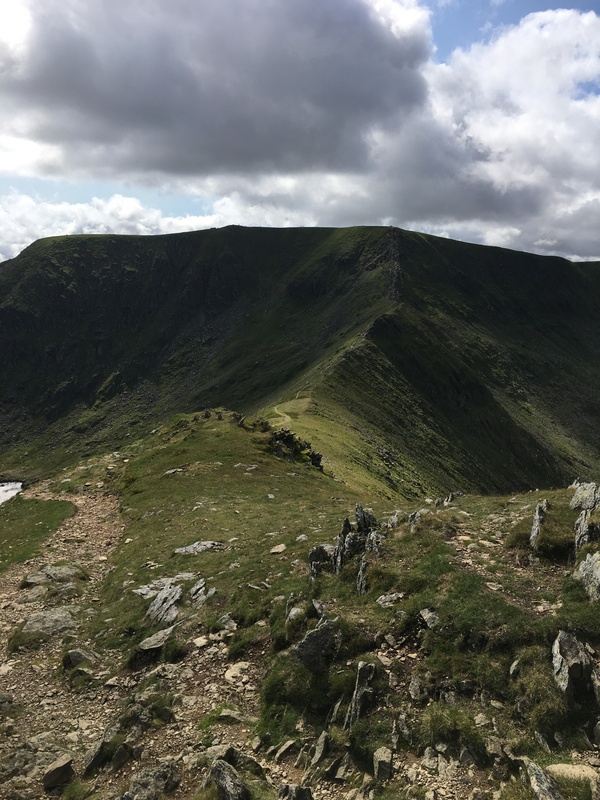 Despite many hiking holidays in the Lake District, and at least two previous walks up Helvellyn via less challenging routes, I had never crossed Striding Edge before. The weather was perfect during this holiday, so I took the opportunity to tick this item off my bucket list. 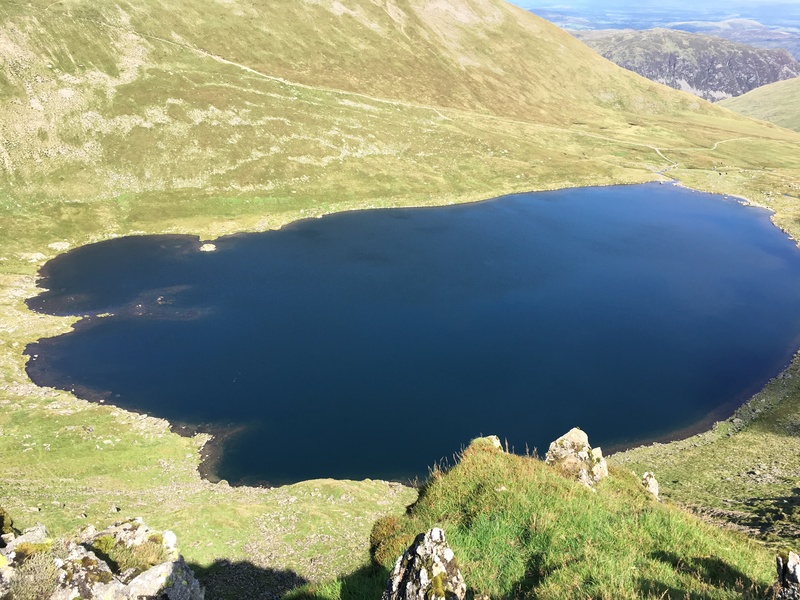 I followed the route from the Pathfinder Guide, which starts at “Helvellyn Base Camp” in Glenridding, climbs up the side of Grisedale then circles around the beautiful Red Tarn. 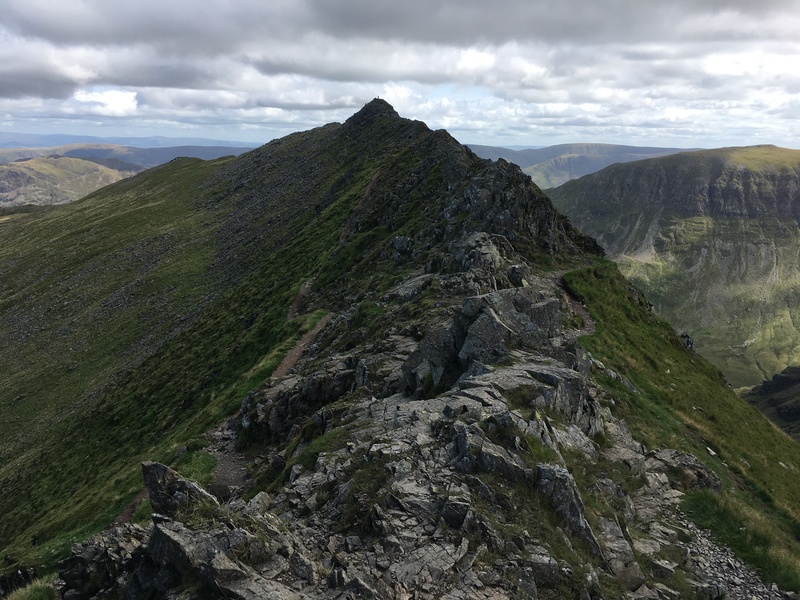 Striding Edge is accurately described in the book as “positively hair-raising”, particularly because you have to scramble over fairly severe crags at the beginning and end of the ridge. 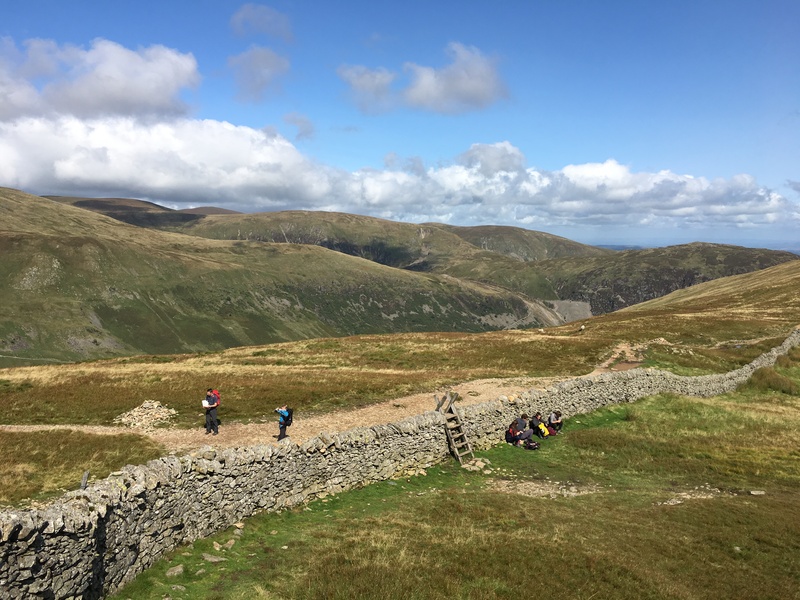 Whilst there is a narrow path just below the ridge, that has a vertical drop to the side and still requires some scrambling – so this isn’t a walk for novices. 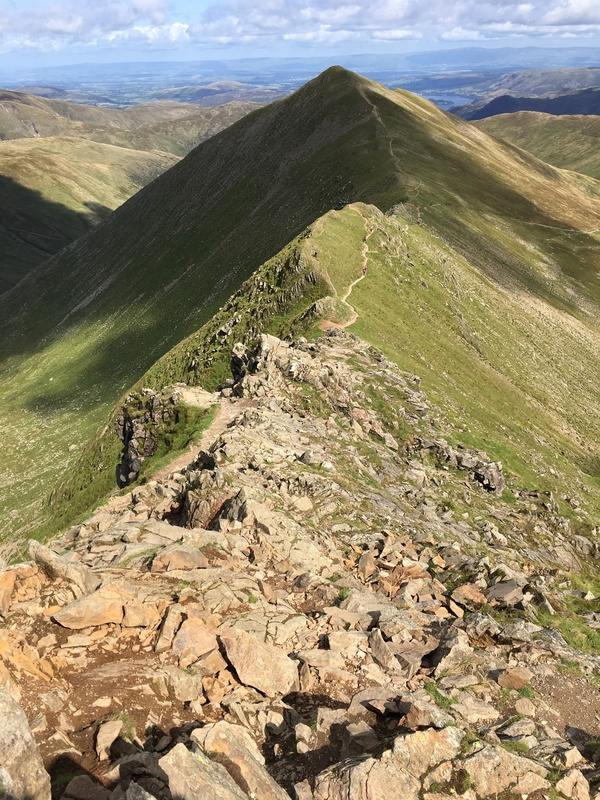 After the exhilaration of crossing Swirral Edge, I didn’t want to drop below the peak of Catstye Cam without climbing that too. 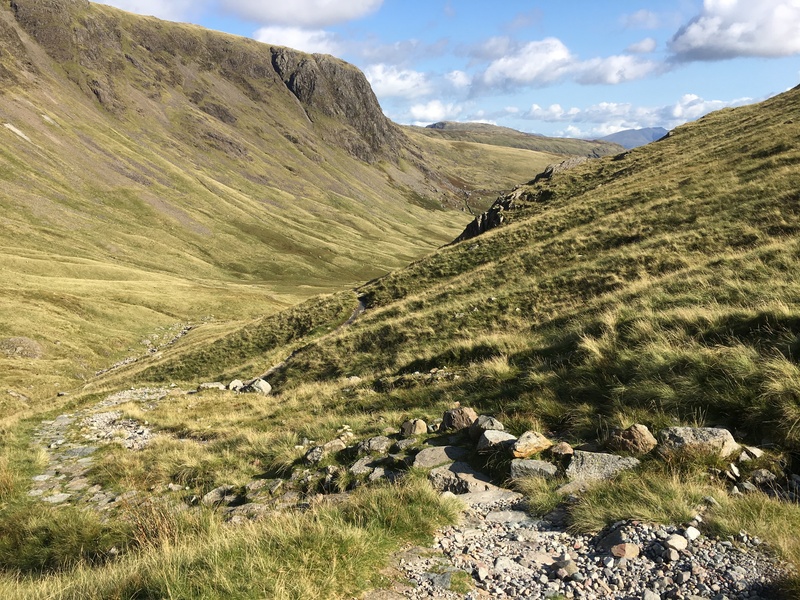 The path down from the end of that descent, though, does not coincide with the path back to the “Hole-in-the-Wall”, so it was necessary to improvise a route across rocks in Red Tarn Beck and climb back up to the official path. This walk was booked as 8.5 miles and my phone recorded 25000 steps and 267 floors climbed that day. 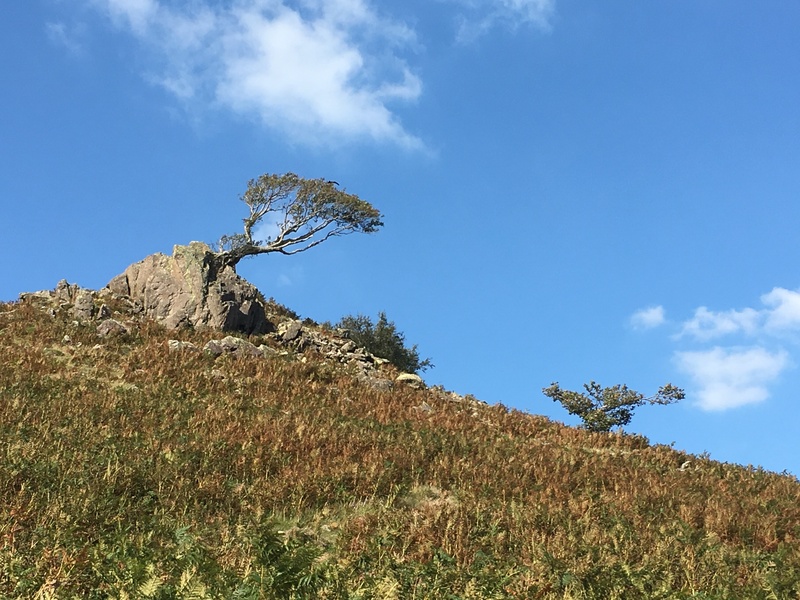 This was a short, family walk starting from Skelwith Bridge. 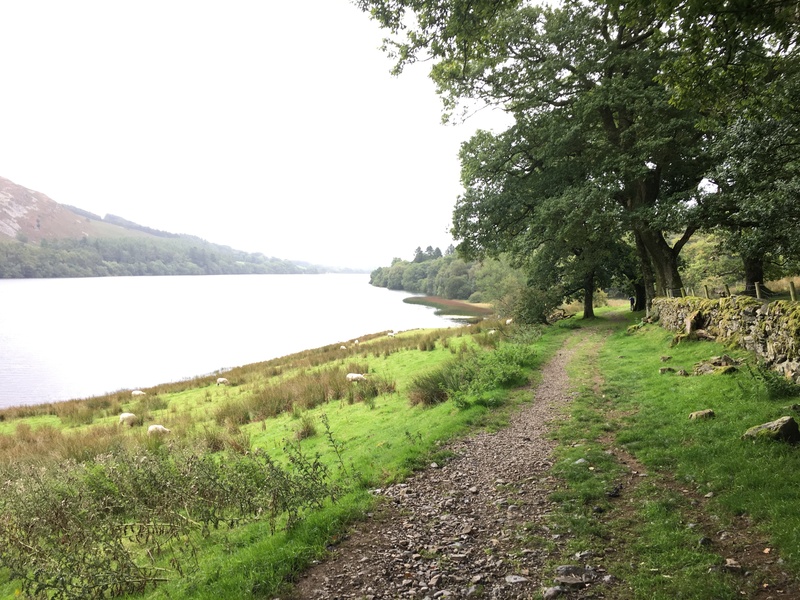 We parked on the road near the Skelwith Bridge Hotel and roughly followed the route to Loughrigg Tarn from the Jarrold Lake District Short Walks book. After a short ascent through a holiday park of wooden chalets, the route around the tarn is quite clear and largely flat. 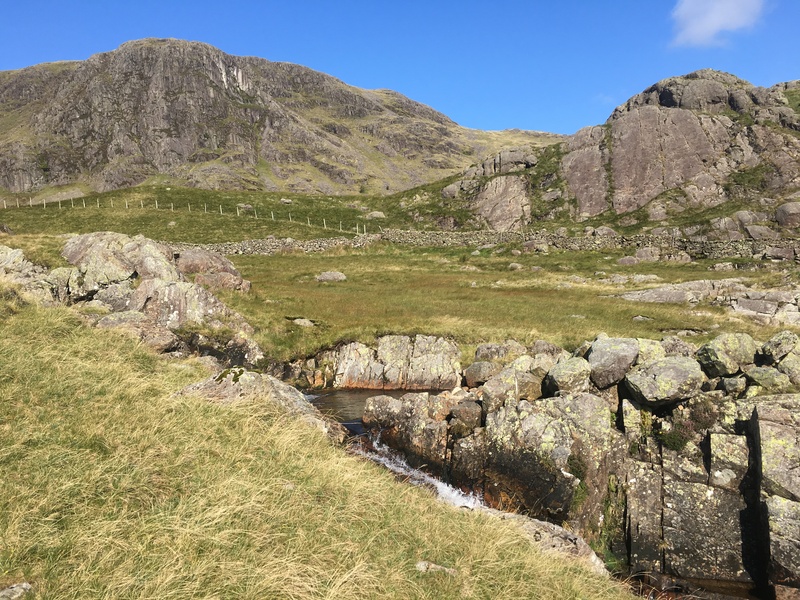 There is a small stream into the tarn which can be jumped or crossed by stepping stones. The circuit is under 3 miles, so is a handy short walk if you need to fill in an hour or so. 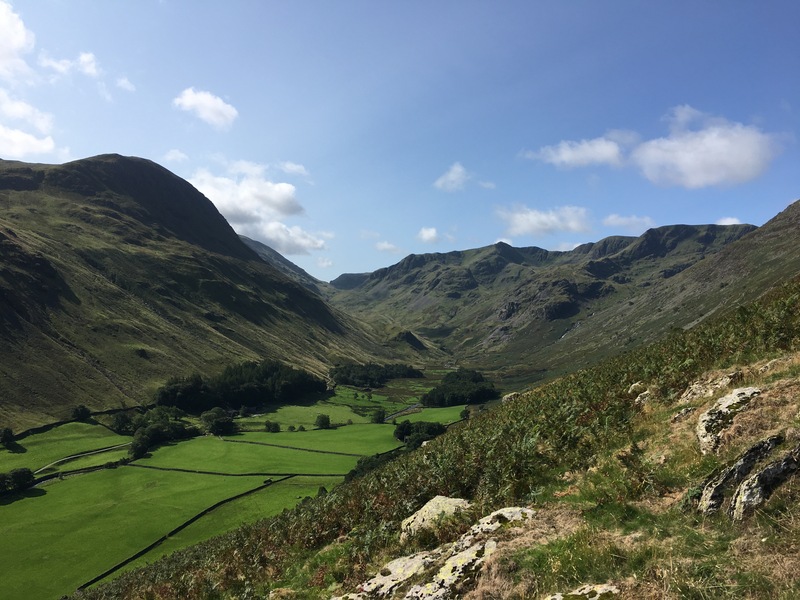 This walk starts from Seathwaite in the Lake District. My Pathfinder Guide advertised that the village has a cafe, but there was no sign of it. 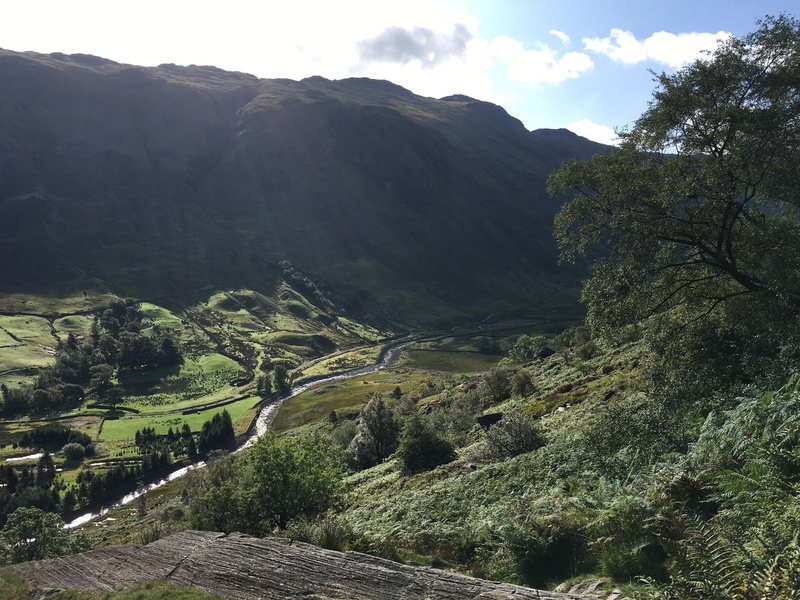 Wikipedia mentions that Seathwaite is the wettest inhabited place in England – luckily for me, the weather was glorious. A local farmer provides car parking in a field for a small fee. 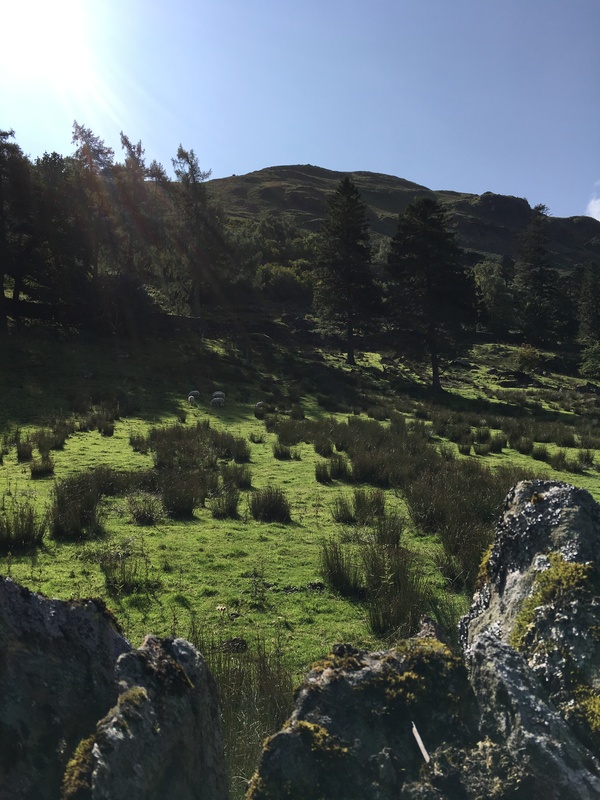 As you look up from the car park, the peaks look pretty daunting and the walk starts with a tough climb straight up the valley side. 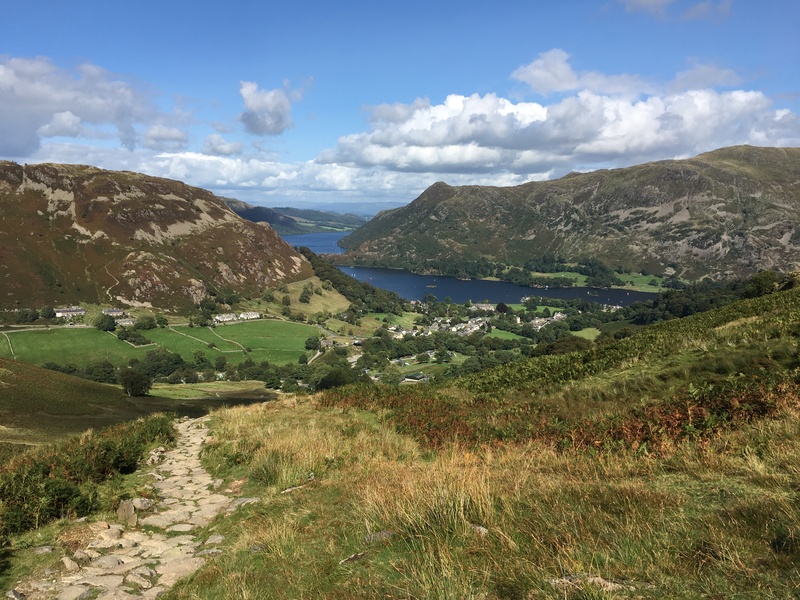 Actually, most of this walk involves climbing or descending – the book wasn’t kidding when it wrote “you need to be reasonably fit to tackle it”. 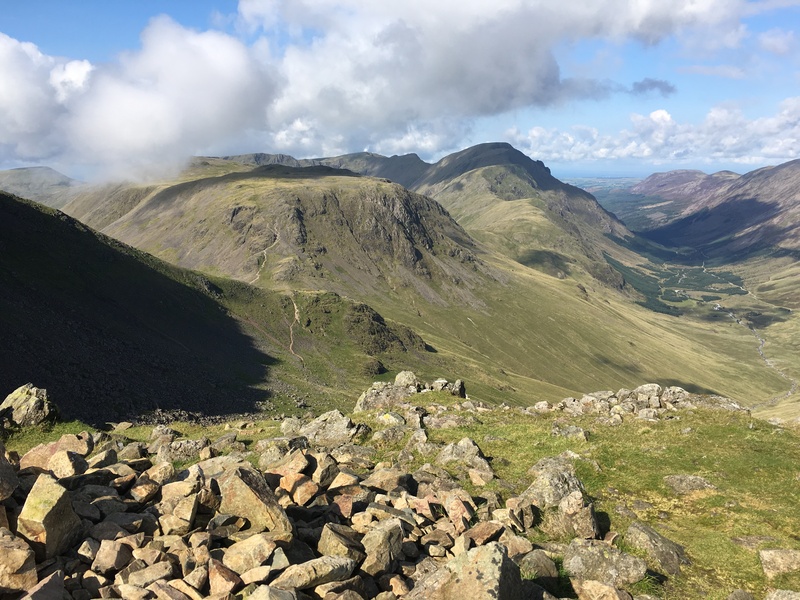 The first peak is Green Gable, offering spectacular views of Scafell Pike and Buttermere. 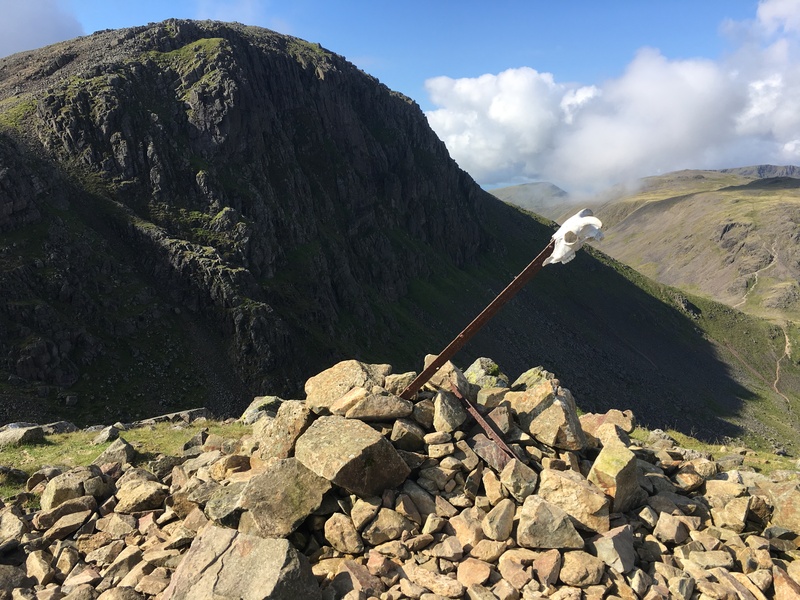 After a steep descent and a scramble back up, you then reach Great Gable itself (site of a memorial to members of the National Trust who died in World War 1). 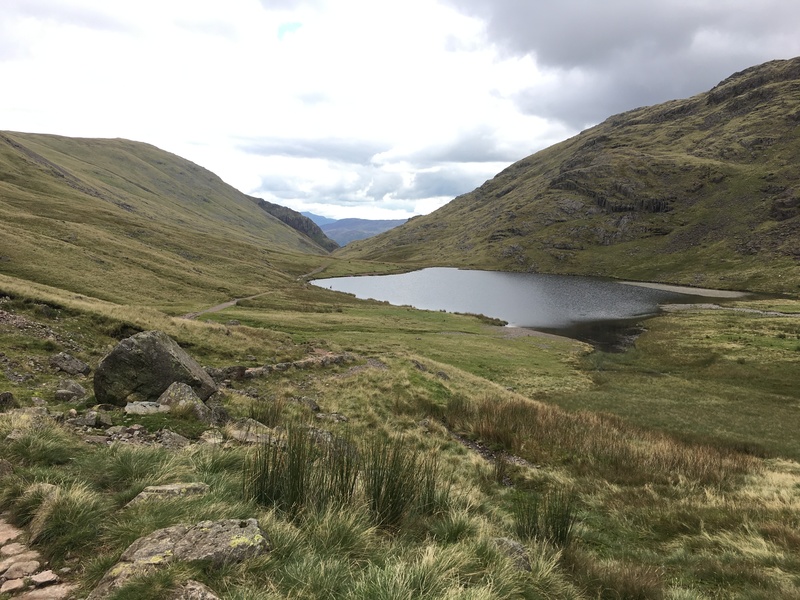 The long descent down to Styhead Tarn is arduous, then the sensible choice is to take the path back via Stockley Bridge. 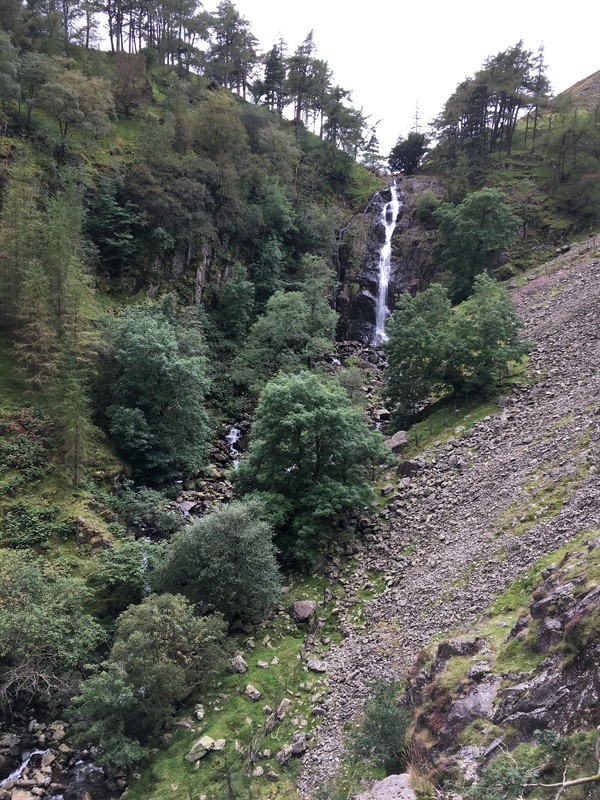 I took the more difficult route to see the waterfalls at Taylorgill – the path is ill-defined and tracks the areas of peat bog, so not recommended. The walk was booked at 6 miles and my phone recorded 25000 steps and 231 floors climbed. 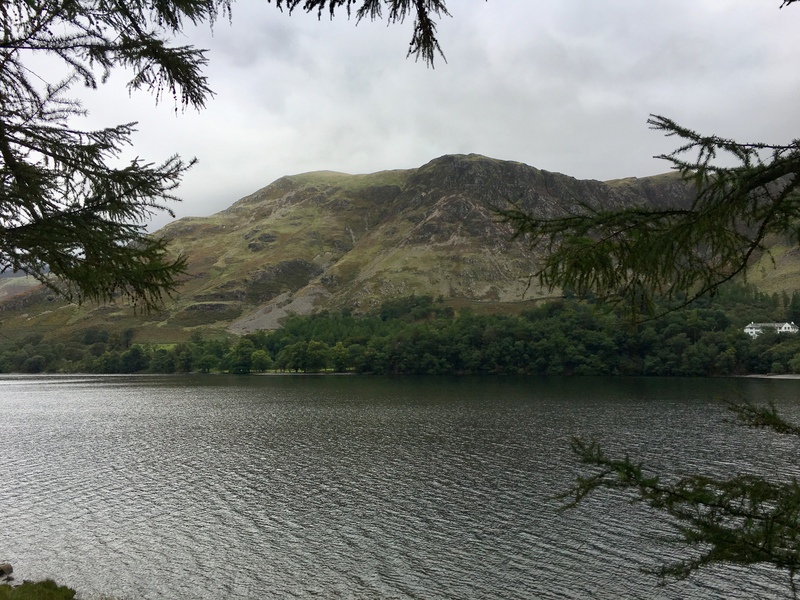 Ullswater is one of my favourite spots in the Lake District. 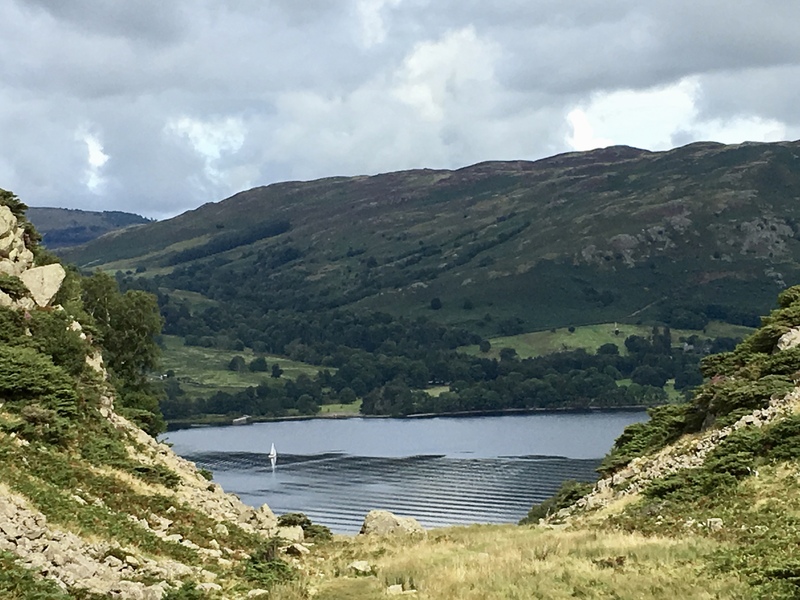 This was a low-level walk from the Pathfinder Short Walks series, with a minor embellishment to take in Silver Crag – we were blessed with good weather and lovely views across the lake. 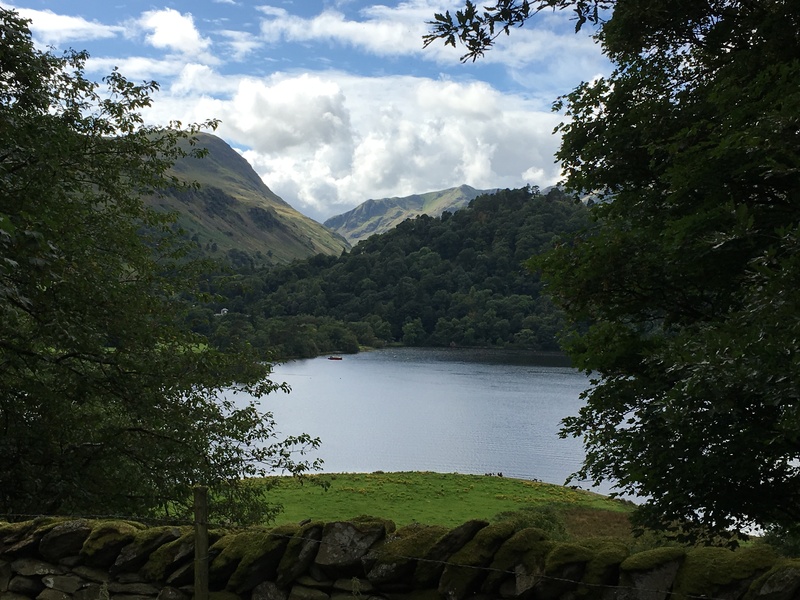 The walk was booked at 5 miles from the car park in Patterdale (mind you, the book said that parking would cost £1 and it has gone up to £4.50 in the 10 years since I bought the book!). My technology recorded it as 23000 steps and 62 floors climbed.